Was wondering, when transfer some personal HD files in FLV, MTS, VOB, MKV, etc files to Xbox 360 for watching via USB, why it's quite moody and won't allow it? Do I have to do something special or am I not allowed to do it anymore? Honestly if I can't play video on my Xbox from a USB I am getting rid of it. I had trouble the last time I tried to transfer some MP4 files recorded by Canon G5X camera to Xbox One for playing via USB. But i have done it before. I used to be able to just play the MP4 files from a USB. Yes you should be able to play a video from a USB drive connected to your Xbox 360/One console. But it also depends on the format of the video (the Xbox 360/One has to support that format). From what I've gathered after doing a bit of research, the Xbox 360/One supports from USB storage device to Xbox 360/One dashboard video player are: WMV (unprotected), MPEG4, H.264, AVI. 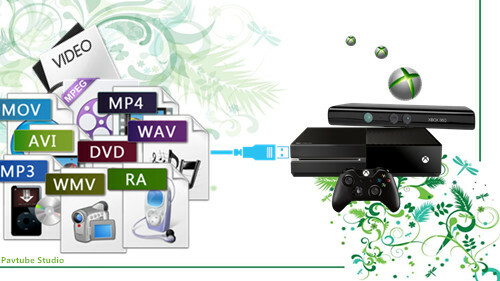 Even if WMV, AVI, H.264 and MPEG-4 are supported, Xbox 360/One has strict requirement for the such those input formats. For more requirement for video playback on Xbox 360/One you can visit Xbox One FAQ and Xbox 360 FAQ. So far I think you will understand why when you wanna transfer some personal HD files in FLV, MTS, VOB, MKV, etc or some MP4 files to Xbox 360/One for watching via USB , the Xbox 360/One not open and read those any more. In addition to compatible WMV, AVI, H.264 and MPEG-4, how do we transfer personal HD files in FLV, MTS, VOB, MKV, etc files to Xbox 360/One for watching via USB? What we need concern first is to get rid of the format limit. In other words, the possible solution is to convert videos to Xbox 360/One compatible WMV, AVI, H.264 and MPEG-4 format first with a third-party software. 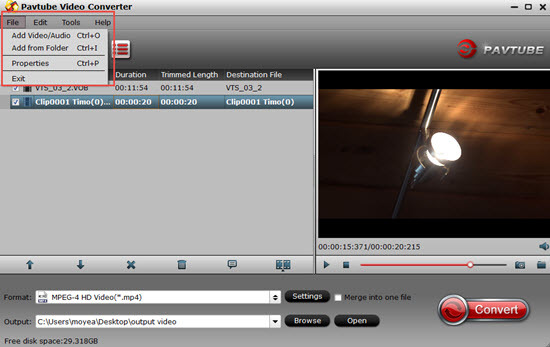 Pavtube Video Converter is highly recommended to help you finish the conversion task. It offers quite effective solution for you to convert any video to Xbox 360/One compatible WMV, AVI, H.264 and MPEG-4 format without quality loss. It also allows you to adjust the video, audio parameter to get a decent output video for a better viewing experience. This program also enables you to play camera files such as GoPro Camera Videos, or downloaded website video such as YouTube videos on Xbox 360/One. Click "Add video" button on the main interface to load your files to the program. You also can drag the file to the program's window list directly. Step 2. Pick Xbox 360/One supported file format. Choose WMV, AVI, H.264 and MPEG-4 as output from the format profile by clicking the format bar. Tips: Click the "Settings" beside the format bar to adjust your parameters is allow you to enjoy a better viewing quality. Plus, before go to the conversion, you can click this "Edit" to do some personal edits on your videos. Click "Convert" button to start your conversion. Once you encode videos to WMV, AVI, H.264 and MPEG-4 compatible format, then you can transfer the converted files to Xbox 360/One for watching via USB smoothly. Besides USB, you can also use other methods to stream media from PC to Xbox 360/Xbox One.